I’m Liv Olteano, and this is my first time spamificating the awesome DSP blog *mwahahahaha* It’s a pleasure to meet everyone! Am I the only one totally in lurve with gadgets and customizations here? You guys love them too, right? Right? I’m SO excited to be here today! 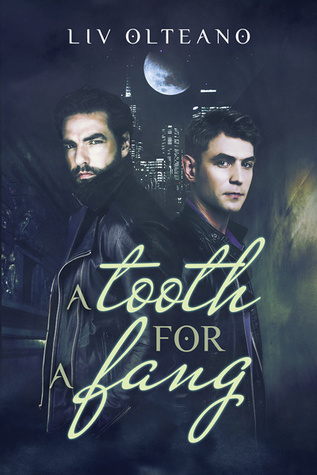 We’ll chat, hopefully also about my first full-length novel that came out just yesterday with Dreamspinner Press, A Tooth for a Fang, available in ebook and paperback. It’s an Adult Mystery/Suspense Paranormal Romance that features two badass and somewhat snarky guys, Rick and Travis, and the love story that develops between them as they’re trying to catch a killer. It’s a bumpy road to their happy ending, because… well, I’m not spoiling it. I am hoping you’ll join them on the road to it, hehe. So, snarky, somewhat smartass characters – I kind of love them as a reader, do you? I thought we’d celebrate together the fact that Rick and Travis are now at large, unleashing their charm (possibly also wreaking havoc…) with a fun Rafflecopter giveaway for one ebook copy of the novel, open internationally of course. The one condition to entering the giveaway is you either have to have or get a free DSP store account, and if you win, the ebook will magically appear in your account’s shelf. You’ll gain entries by answering one or all of the questions on the Rafflecopter. Keep in mind there’s no wrong answer to any of them, simply choices These are situations that may or may not be related to the story, hehe. Sounds like fun? I hope it will be. Here’s a little more about the novel, and you’ll find the Rafflecopter form right below that. Don’t have a Rafflecopter account? No worries, simply sign in with a valid email address and a name, I’ll use that email address to contact you if you’re the winner, so make sure it’s a good one, eh? I’m coming back in a couple hours with a couple excerpts to properly introduce Rick and Travis, later on we’ll put together a playlist for them, and if you’ll wanna help me I’d totally love it, and later still we’ll announce the giveaway winner and wrap up. Sounds like fun? Purrfect! See you guys in a couple hours! I’m so happy to chat with you!! Just finished your rafflecopter giveaway!! First of all, Congrats for this new release!! I’m thrilled to spamifica… cr-cram, I mean chat with you Hehe, glad to hear it. And thanks so much! Gadgets, vamps, killers? I’m all in!!! I have a DsP account and I just answered your rafflecopter questions. Went with my gut instinct and I love the cover, the story and I look forward to reading more about Rick & Travis…. Hi Liv! Congrats on the release of your book. It sounds great. I loved the questions you had on the rafflecopter giveaway. Thanks so much for the chance to win a copy of your book. Awesome! Hope you had fun with the questions, hehe, I know it’s gonna be interesting to check out the answers Love to cover too, AngstyG did a fab job, right? Oh, no worries, it’s gonna be quite late over here too! Besides, Vamps are always welcome to any party, right? Thanks! I wanted to go with some fun questions, hope I nailed it…so to speak, lol. Agreed, I don’t like needlessly mean either. Ok Liv…let’s make a list because I adore everything about the Supernatural world..
Soooo…what’s your fave Tv series? I’m talking about Paranormals’ one. Love Fringe too Didn’t watch episodes properly, iFail, but I liked the ones I did get to see! Also, Lost Girl. For the win. Just wanted to recommend a show since you all made a list. I’be just recently gotten into this show called The Strain. It involves vampires but their not the glamorous ones we’re use to seeing in movies like Interview with a vampire or those in True Blood. The concept is awesome and these vampires remind me a bit of Resident Evil 4( the game not movie). This sounds like a great book – congratulations! Andrea M, thanks so much! I’m not sure about the poster with the eye. But I think the one I saw had like a person or thing coming out of murky reddish water. It’s really good and the format of the show makes me think of Fringe. Well now, H.B., I waaanna watch The Strain, lol! I watch LOST GIRL (though my hopes aren’t high for the upcoming season–last year it faltered a bit), and I like THE ALMIGHTY JOHNSONS (even though I can’t tell how quickly it will progress). My favorite paranormal was the short-lived REAPER–totally hysterical and clever show with Ray Wise as Satan. Shhh, don’t tell me Lost Girl goes downhill, lol, Trix! I’m not up to date with it. Somehow, most of the shows tend to go downhill at some point, sigh. Didn’t watch The Almighty Johnsons, but I did see quite a few Reaper episodes Hilarious, loved Ray Wise as Satan, he was my fav from the show!